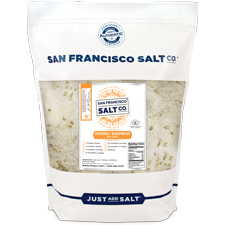 Pure Pacific Ocean Sea Salt is infused with real Saffron Threads and Fennel Seeds, resulting in a distinctly unique, fragrant flavor! The sweet, perfumy, anise-like flavor of Fennel Seeds perfectly complements the distinctive musky floral flavor of Saffron Threads. Two deeply rich aromatic ingredients come together to form a unique salt that smells as delightful as it tastes! A DISTNCTIVE DELIGHT - The sweet, perfumy, anise-like flavor of Fennel Seeds perfectly complements the distinctive musky floral flavor of Saffron Threads. This is an incredibly distinctive but versatile salt that is sure to leave a lasting impression on your palate. 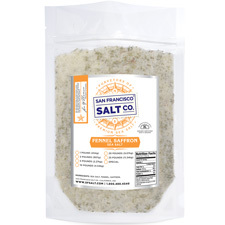 AN ESSENTIAL INGREDIENT FOR PROFESSIONAL & HOME CHEFS ALIKE - The ultimate cooking salt, our Fennel Saffron Sea Salt transforms homemade dishes like risottos, spanish rice, fish soups, and paella into esteemed culinary masterpieces.